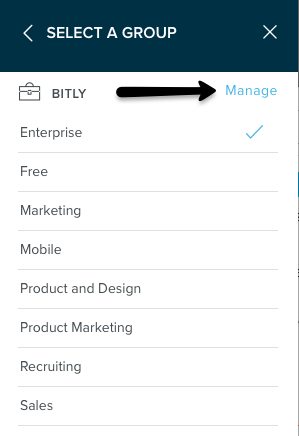 You can add current users or invite new users to your group at any time through the Bitly Brand Manager. To add a user to a group or invite a new one you must be a Group Admin or Account Admin. Navigate to Account Management section by selecting the Group icon located between the "Create" button and the hamburger menu. From here select "Manage" next to your account name. Once in Brand Manger navigate to the the "Users" section. And then select "Invite New User"
From there you'll be prompted to the invite user page. Enter the email address or username connected to the account you're inviting. Also select the groups you'd like to give them permission to by checking off the desired boxes. Select "Invite" and the user will be added to your groups. What is a tracking domain?